Bill's Shrine. He liked a good poet game. Today's challenge is to learn a little more about creativity by watching a short talk with author Elizabeth Gilbert. Find it at the end of this post. 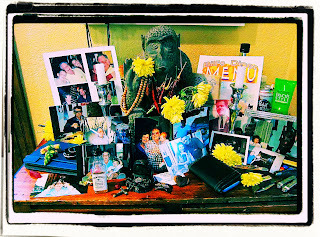 Then take a little time to create an inviting shrine to your muse/genius. It can be tiny and portable; elaborate and juicy, or written in your imagination. CHOICES, you get choices. Trust me, these get easier. My shrine is made of a matchbox cover with Joss paper. It has a shell, a rock, a little burning bowl for the isolation of block, a sweet for enticement, and a mirror. It can be opened and inviting, and I really like that it can be shut when muse is regenerating. Your version of this assignment could be physical like mine, or much simpler (a special tablecloth at your writing desk). It could be a written proposal for your ideal shrine. It could be symbolic-- a seed you carry in your pocket. Get the drift? Get your shrine on. Watched this directly on TED.com as the embedded link didn't work really well for me. I like her idea of dis-identifying (at least a smidge!) with the creative force, sort of a variant of externalization/narrative therapy, as in "my genius elf didn't show up today, even tho I did...I fulfilled my part of the bargain"....a way not to have to carry all the weight (good, bad or otherwise). I too needed to watch from TED.com, and 'ole'. Another reminder that maybe prayer does work. Glad you're in the quest! Let me know what happened with the Ted. Size? Freezes or doesn't load? time to clean off the writing table in my bedroom. last summer i set up candles, and a plant, and matches to burn incense, with polished stones nearby and a window to let in morning sun. a place to write morning pages in the first-waking moments. somehow as the fall wore into winter, i stayed in bed longer, and the table became a catching place for not-quite-dirty clothes that don't need to go into the laundry basket but haven't been worn again or hung up yet. empty book for word journaling at that table, need a direct path to empty staff paper at piano for music journaling. Cleaned up the shrine, rocks from my travels, mica, a feather from one of my parrot friends at the Iowa Parrot Rescue, silk. Elizabeth Gilbert's a tough one for me, though, because the ashram that she frequented in Eat, Pray, Love, actually isn't as free from stain as she presented it to be, and her version made me wonder about the validity and depth of her vision. Well, hey, nobody's perfect . .. .. .. . .